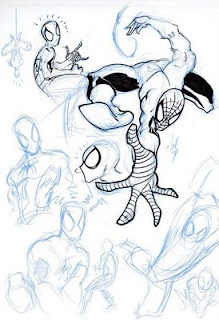 The Tanoshiboy Chronicles: Design & Illustration Blog: Does whatever a spider can! I thought I'd change it up and draw up some Spidey. I tried a more relaxed, quick sketch technique. I even held the pencil different. I t really helpe to loosen up the wrist and get more dynamic sketches. It's always important to not care what you're drawing and just focus on how you're drawing it. Nothing looks better than dynamic sketches. I think I might have been too tight lately. I'm hoping to rectify that this week. See how it goes.